This HR Pacific home is a finalist for a CHBA award. The Canadian Home Builders' Association (CHBA) Rocky Mountain has announced that Golden's own HR Pacific has been named a finalist for the Georgie Awards. The Georgie Awards, now in their 21st year, are known across Canada for rewarding excellence and innovation in the home building and renovation community. A stunning new home project in Golden has once again caught the attention of the Georgie Awards panel of judges. "This year's awards raked in more than 500 entries that feature amazing, brand-new homes and breathtaking home renovations throughout B.C. in a total of 45 categories, showcasing the culture of imagination and ingenuity that just grows stronger in B.C. 's industry each year," said Sharrie Paulsen, executive officer for CHBA-Rocky Mountain, in an interview with Golden Star newspaper. 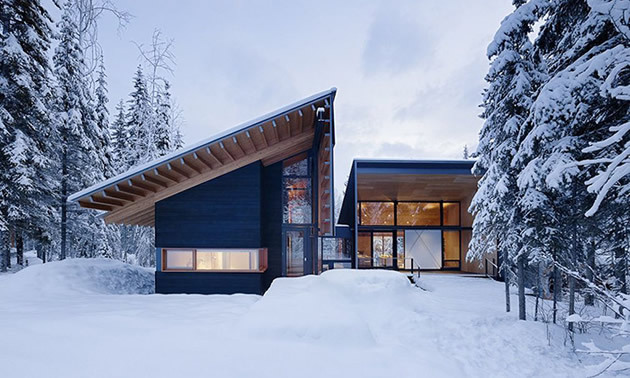 For beautiful contemporary custom homes surrounded by trees in an alpine setting, HR Pacific Construction Management Ltd. was chosen as a finalist in the Custom Home Valued Between $1,500,000-$3,000,000. "British Columbia's home building and renovation community is constantly raising the bar with the new home and renovation projects they create," said Mike Delich, Canadian Home Builders' Association of BC (CHBA BC) secretary treasurer and CHBA Rocky Mountain member. CHBA Rocky Mountain would like to extend their congratulations to one of its members David Ratzlaff of HR Pacific Construction Management Ltd for being a Georgie Award finalist. View all the finalist galleries at georgieawards.ca.